I have updated the Silverlight Globalization Namespace Comparison document that I wrote a while back for Silverlight 3. 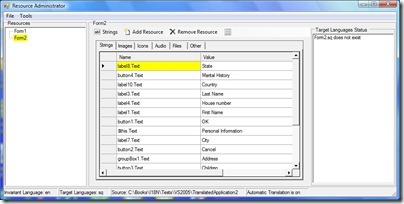 The document compares all of the classes (and their properties and methods) in the System.Globalization of the .NET Framework with the same namespace in Silverlight. The update, however, is disappointing because there have been no changes in this area so the answers for Silverlight 3 are the same as for Silverlight 2. I found it a really interesting idea and I think it would work at events in our industry. In some ways it is like the sadly unsuccessful Ask The Experts that was tried a few times at DDD in Reading. In the Ask The Experts format lots of experts hang around waiting for people to come up and ask them any question at all. It seemed like a good idea but it never worked which was a shame and at the time we couldn't see how to fix it. The poster sessions appear to solve the Ask The Experts problem by having a physical focus, a clear subject matter area and a ready made set of discussion points. We might try this out at DDD South West 2. The 14th annual LRC (Localisation Research Centre) conference will be held on Thursday/Friday 24th and 25th September 2009 in Limerick City, Ireland. I will be there presenting a poster. This is a new kind of presentation for me; the idea is to stand in a communal area during the break for lunch next to an A0 poster that you have prepared and be prepared to chat to anyone who is interested. It seems a bit like the Ask The Experts format but with better focus. If it works I might try it at dev events in the UK. 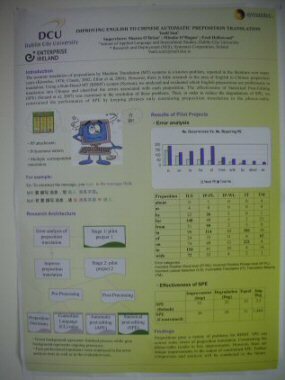 My poster is on Internationalizing Silverlight and is based on the presentation that I have started giving this year. All in all I'm very excited about LRC as it will be a rare treat for me to be at a conference that is solely on localization and everyone there is guaranteed to be interested in the subject. The second Alt.NET Bristol Beers will be held on Wednesday 16th September 2009 at the Portcullis in Clifton, Bristol. People will be around from 6:00pm and the voting starts at 6:45pm.